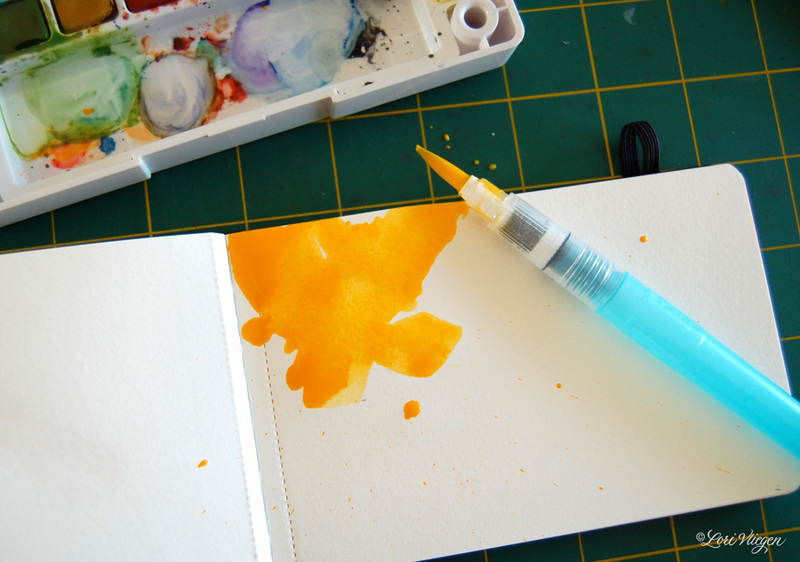 that was fully loaded with permanent-yellow-deep watercolor, was accidentally dropped. big yellow accidental splotches always make good sunshines! Fun happy accident! Love it! Way to make lemonade, er sunshine, out of lemons! Lori, I think this was a serendipitous event and you've made the most of it. She tumbles, rolls and back on her feet accidental art so cheerful. Awesome words you captured to sum up this lesson/reminder from the Universe! 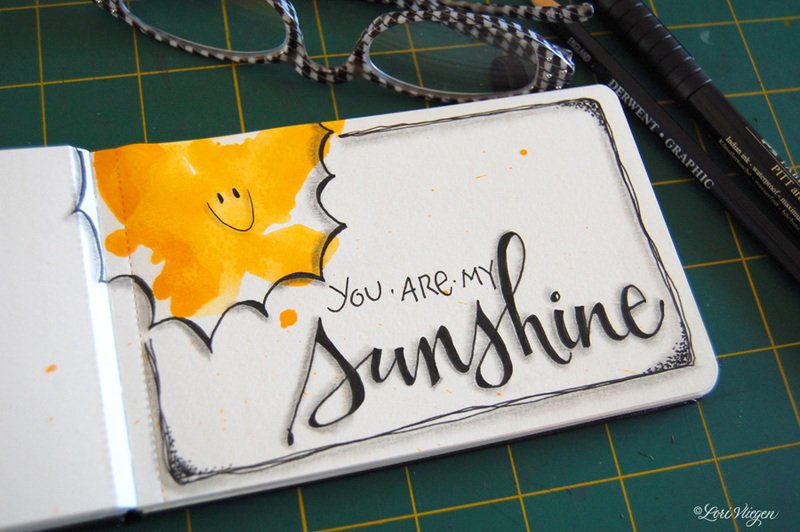 Have a happy day now that the sun is shining on your page! ps. where have you bought this weird brush?? I saw it on a lot of blogs, but I ccan't buy it in my country.. you know an internet shop or something?? sorry for bothering! Ahhh.... another VIP life lesson in a bit of splotched paint color!!! When life gives Lori yellow splotches - she makes sunshine!! Bravo!! love your happy song accident!! Hahaha! Brilliant...as sunshine. And I bet your Choice Words were, "i need more chocolate now". Very creative! Gotta love those happy accidents! That is so cute! Love your positivity! LOVE IT and your ability to take mistakes and make them masterpieces!!! Lori you are brilliant!! I look at these accidents not as mistakes, but creative opportunity. I love it when they happen because they really do become something incredible!! As always, I LOVE your artwork and that you share you with the rest of us. acrobat waterbrush...you are so freaking cute! Ha ha....love the drama you created here! 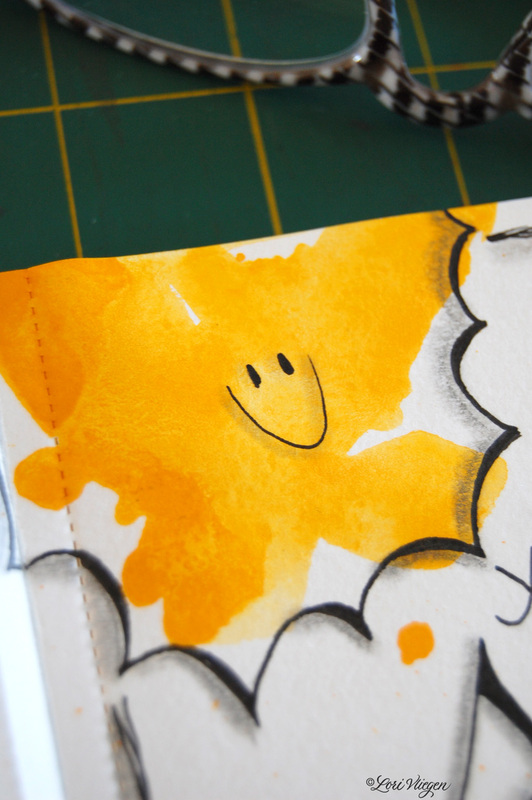 thanks for the email a couple days ago about the pocket moleskine watercolor book. mine came in the mail today and i can't wait to try it out! thanks again! Amazing! nice improvisation! I really like it. happy happy happy accident, so fun! i love what you did with your yellow splash of color. thank you for your kind wishes for this weekend. OK, so my question is... did you load the barrel up with the ink? I LOVE THAT IDEA! My brain is spinning with possible applications of that... I just bought extra parallel pens for that some purpose, to have different ones loaded with distress ink. :-) Now THAT can be an expensive thing, but I LOVE PARALLEL PENS! No limits to your fantasy!! ...and yellow is my favourite colour. I love your capricious brush! It's raining here: your yellow smile makes bright my scraproom. What a bright, happy accident. I just spent about an hour going through your site. I love it! The combination of text and paint and other mediums is great! I'm definitely going to be a constant follower.